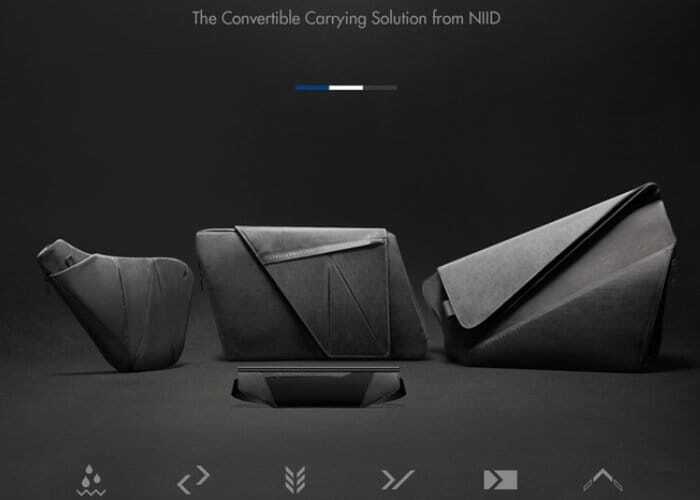 Luggage manufacturer NIID has once again taken to Kickstarter this week to raise funds to take its new Switch everyday backpack range into production. In just its first few days the crowdfunding campaign has already blasted past its required pledge goal, thanks to nearly 300 backers. Raising the funds required to take the Switch convertible and customisable modular everyday backpack and luggage system into production. The Switch modular carrying solution consists of four individual bags and pouches which can be used together in a variety of different ways. Offer a waterproof gadget bag for any occasion, and equipped with plenty of pockets and capable of carrying a 15 inch laptop or 10 inch iPad or tablet if needed. Watch the demonstration video below to learn more about each Switch component. Other features of the new NIID Switch bag range include magnetic closures, expandable front covers, side pockets, back pockets, YKK RC zippers and more. NIIDs latest everyday backpack range is now available to back with early bird pledges starting from $89 or £64, if all goes well shipping is expected to take place during June 2018. The “interchangeable and ergonomic bags were designed for easy transitions” say its developers. The latest campaign builds on the company’s previously successful UNO II interchangeable backpack which raised more than $165,000 thanks to over 1,660 backers last year. For more information, full specifications and a list of all available pledges jump over to the official NIID Switch campaign page by following the link below.